Both in the production side of her music and in its content, Akyol imagines dreaming as a political practice. Unlike a superficially similar figure like the musician Grimes, who has seen no contradiction between her feminist spaceship aesthetic and defending the union-busting philosophy of Elon Musk, Akyol is committed to a radical vision of equality. Specifically, her video imagines a way out of the current polarization and violence of Turkish society. Of the people who are traveling on her minibus to space, all are visibly from different social strata. There are workers, women wearing the headscarf, a gay man, a woman with dyed hair and a beanie, a man with a religious skull-cap, hipsters, a trans woman, and–thrown in for good measure–a group of strange black-shrouded monks from space. This message of togetherness may be simplistic. It certainly does not put forward practical strategies for thinking about what forms feminist, anti-capitalist struggle will have to take in today’s terrain—but that is not the point. 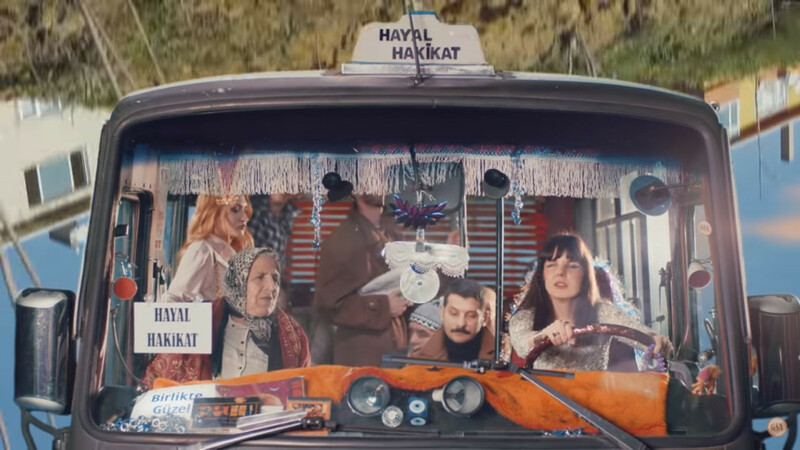 Image: Still from Gaye Su Akyol’s music video for the song “İstikrarlı Hayal Hakikattir” (Consistent Fantasy Is Reality). Via Blind Field.